The Newbury and Thatcham Bahá’ís, in conjunction with the Bahá’í community worldwide, are preparing to celebrate, on 21st October 2017, the two-hundred-year anniversary of the Birth of Bahá’u’lláh, the Founder of the Bahá’í Faith. 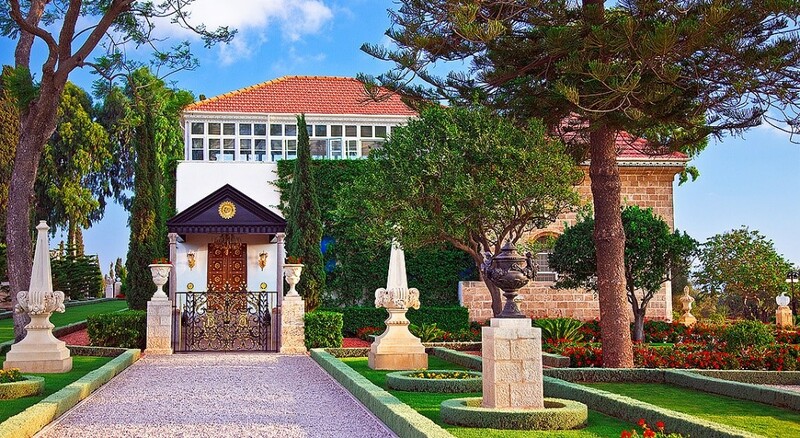 Formal gardens surrounding the burial place of Baha’u’llah, located outside Acre, Israel. With the appearance of Bahá’u’lláh, a new impetus for the unity of the human race has been released into the world and is the next stage in the awakening and progress of humanity. In the middle of the 19th century, Bahá’u’lláh outlined a framework for the development of a global civilization which takes into account both the spiritual and material dimensions of human life. Bahá’u’lláh suffered 40 years of imprisonment, torture and exile for bringing God’s latest message to all the people of the world. Today, His life and mission are becoming increasingly well-known around the world. Millions of people are learning to apply His teachings to their individual and collective lives for the betterment of mankind. The Bahá’í Faith is the youngest of the world’s independent monotheistic religions. Founded in Iran in 1844, it now has more than six million adherents in 236 countries and territories. Bahá’ís come from nearly every national, ethnic and religious background, making the Bahá’í Faith the second most widespread religion in the world. Its founder, Bahá’u’lláh (1817-1892), is regarded by Bahá’ís as the most recent in the line of Messengers of God that stretches back beyond recorded time and that includes Abraham, Moses, Buddha, Krishna, Zoroaster, Christ and Muhammad. Bahá’ís believe that all humanity was created by one God and we are all part of one human race and that the purpose of life is to know and to love God, to acquire virtues, to promote the oneness of humankind, and to carry forward an ever-advancing civilization. Bahá’ís practice their religion by praying and reading the scriptures every day, dedicating their lives to service to others, following spiritual and moral principles such as trustworthiness, chastity, honesty, etc., and avoiding gossiping, alcohol, drugs, materialism, and partisan politics. They meet in fellowship to worship and to share news and refreshments every 19 days and during specific holidays.